Imagine if you combined the flavours of chocolate, biscuit and marshmallow into one awesome, delicious snack of gooey goodness, the S’more, you can never go wrong with this classic campfire snack. It’s perfect for kids (of all ages). Lay one biscuit on a flat surface and then a piece of chocolate on top. Put marshmallows on a stick and cook over a campfire. Once the marshmallows are nice and gooey, lay them on top of the chocolate biscuit combo. Grabbing another biscuit, make a sandwich. 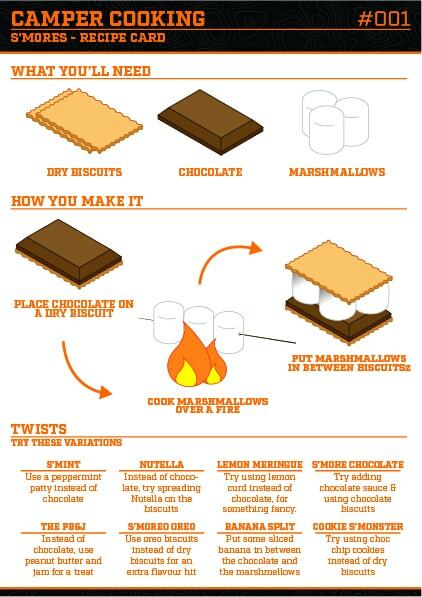 DOWNLOAD THE RECIPE CARD HERE, INCLUDED IS A BUNCH OF TWISTS YOU CAN DO ON THIS CAMP FIRE CLASSIC.